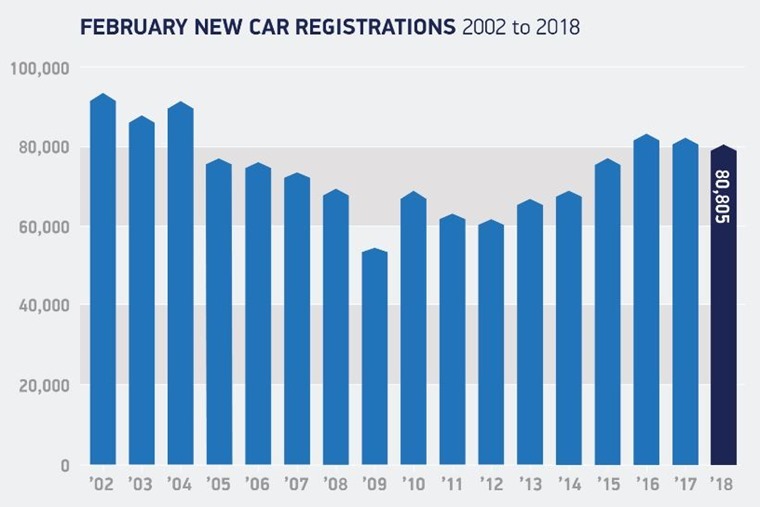 The UK’s new car market declined 2.8% year-on-year in February, marking the eleventh consecutive month of falling new car registrations. 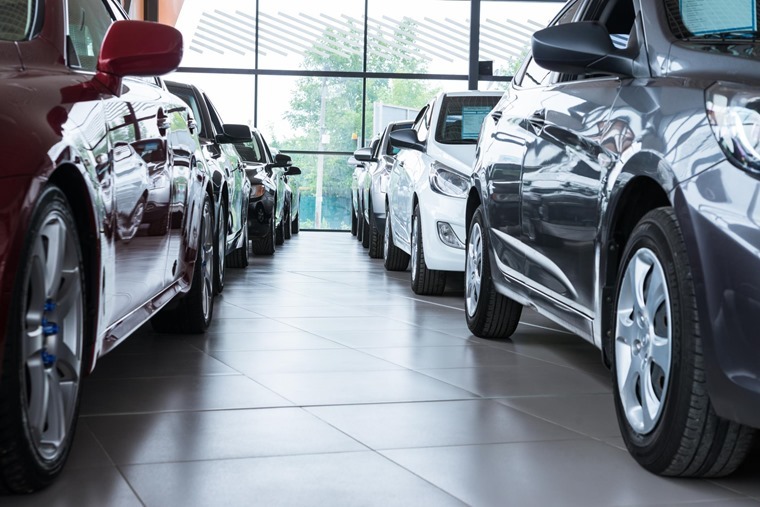 The latest figures from the Society of Motor Manufacturers and Traders (SMMT) revealed a total of 80,805 new cars hit the road last month – down from 83,115 in 2018. So far this year, the UK new car market has declined 5.1%, with registrations by business, private and fleet buyers all down, 29.8%, 7.1% and 2.1% respectively. 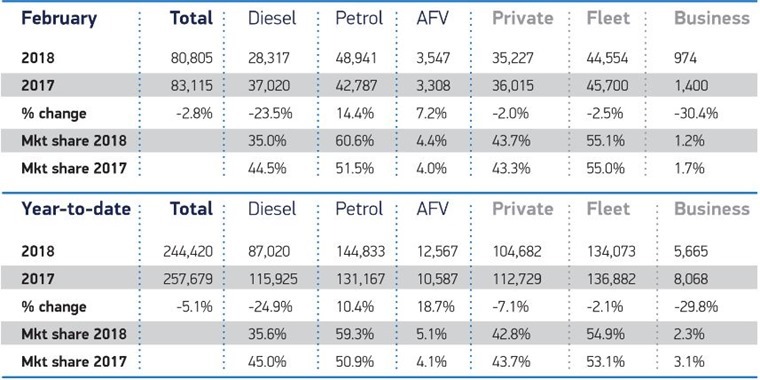 Although February is traditionally a quiet month for the car industry ahead of the new number plate release, a 23.5% year-on-year fall in diesel registrations remains a large contributing factor for the fall. Continuing recent trends, demand for petrol and alternatively fuelled vehicles (AFVs) rose in February, up 14.4% and 7.2% respectively, with the former driven by some new, smaller models coming to market. Despite double-digit growth in petrol registrations, it still remains unable to make up for the fall in diesel, which now has a 35.6% market share. This suggests that diesel drivers are keeping older cars for longer – disappointing considering the latest diesels can help address air quality issues. That’s also something that the government was keen to avoid, but no doubt the upcoming first-year VED hike for diesels as well as rhetoric surrounding potential clean air zones have contributed to the fuel’s decline. What’s the most popular car? 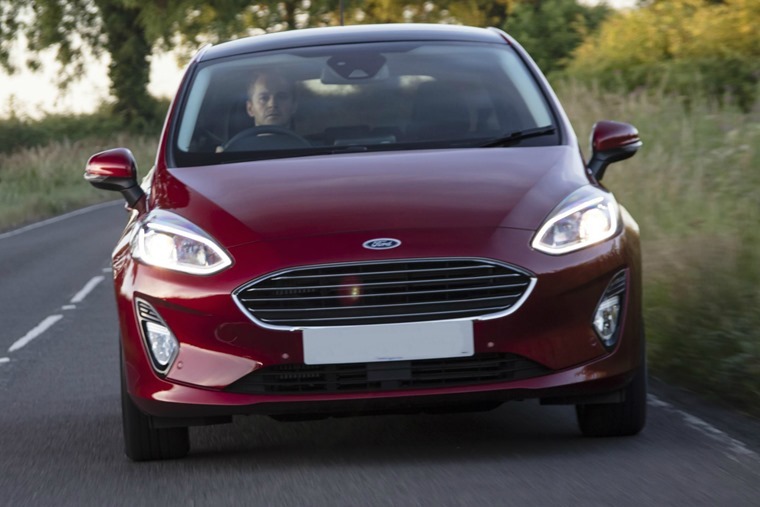 As ever, the Ford Fiesta remains flavour of the month and comfortably retained its number one spot in February. Meanwhile, the Golf was the second-most popular last month and in the year-to-date, while the remained in third position. Crossovers continue to dominate the market too with the Ford Kuga, Vauxhall Mokka X and Kia Sportage all featuring in February’s top ten. None of them could trump the Mercedes-Benz A-Class however, which found itself in fourth place, proving people are increasingly favouring premium models largely thanks to attractive finance options. Despite diesel’s decline however, the UK remains Europe’s second-largest new car market. Looking ahead, the SMMT expects that registrations will continue to fall this year following record registrations in 2016/17. Forecasts predict the fall will be between 5% and 7% in 2018.